It’s nice to talk to you again, and to share the great news (and great whiskies) we have in store for you. We cannot believe that the Expo is just four short weeks away, and that soon, we will all be together on the exquisite San Francisco Belle--perhaps the most popular and unique WoW Expo venue--to nose, swirl, and enjoy the most revered spirits in the world. With more than 200 expressions present, the show is sure to be one of the largest ever, and SOLD OUT earlier than last year! If you haven’t already done so, buy your tickets now and prepare to dive into the water of life. Upcoming Live Interviews with our Whisky Rock Stars! R. Gallyot's "Airwaves." An interview with Benji Menendez. A legendary cigar maker for Partagas. Partagas and Cohiba being the official cigar sponsors of WoW 2012. Dining Around: Interviews with Lance Winters (proprietor of St. George Spirits) and Steve Beal (Diageo's Master of Whisky). In the last newsletter, we promised to uncover the names of a few debutantes in this year’s Expo. We can’t wait any longer: announcing Silvano Samaroli (parli Italiano?) and his mind-blowing collection of single malts of distinct origins and tasting profiles. As much as we’d love to add Italy to the whisky-producing countries list, the “spirit of oats” ("Italianized" for whisky. Any history buffs know why the reference to oats?) you’ll sample are the unique bottlings from the famous Scottish distilleries, such as Tomintoul, Glenlivet, Highland Park, and other staples. The exciting whiskies have just appeared on the U.S. market, are the hand-selected products of the first non-Scottish independent bottler ever released in extremely limited quantities. Isn’t it the guarantee of a truly special tasting experience? Mr. or rather Signore Samaroli will be sending his devout apprentices to share his in-depth knowledge of the very complicated world of Scottish malt distilleries and his half-century maniacal perfectionism in the process of cask selection. Feel it in every generous pour of, say, Tomintoul 1967. With this selection, anyone who has not had the pleasure of tasting Silvano Samaroli’s first bottlings will be able to experience otherwise incomparable emotions. 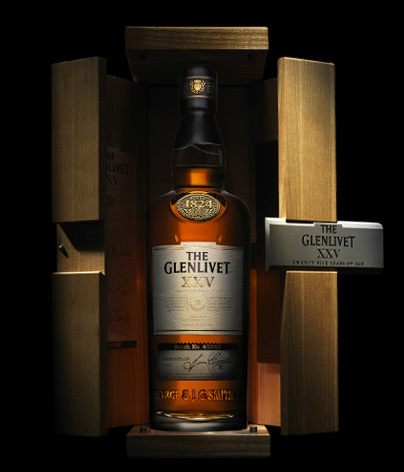 Those loyal to the “original” bottlings will be happy to find their favorites and make a thoughtful, and hopefully objective, comparison with the same-labeled “independents.” It may be a difficult task, especially with such a quintessential malt as Glenlivet, with its three-faceted personality: an easygoing and well-rounded friend, great digester and overall health benefactor, and engaging legend teller; all traits that made it so irresistible to a Scotch lover. This year, the first licensed (read: legal) distillery, Glenlivet will be supplying six different bottlings from its prolific and no-longer-secluded “glen” for your ample enjoyment. From the approachable and aspiring “youngest brother” Glenlivet 12 YO, the patrimonic and assertive Glenlivet XXV, to an “in-law” Glenlivet Nadura, a distinct cask-strength bruiser that somehow still manages to carry the delicacy of the Speyside charm in its powerful hands. Meet Richard Edwards, your trustworthy guide into the world of Glenlivet whose whisky-like career swirled from a Red Beret Paratrooper to the Master of Scotch. Mr. Edwards will make you philosophically speculate the influence of whisky in important life decisions, and then you'll call for another dram of Glenlivet. It’s "the single malt that started it all," indeed! Our Scotch list continues to grow. Out of 200+ expressions, a good portion will originate from the “free-willed and proud” part of foggy Albion. Make the booth by Anchor Distilling, a California-based importer of ultra-premium spirits (your other Scotch getaway) and delve into the historical ebbs and flows of whisky production in the Campbeltown region. Treat yourself to the delicious and resonant whiskies, and you will be pleased to know about the revival of Campbeltown (“survivor” doesn’t suit it, really) as a rightful whisky-producing region with only three operating distilleries. Here is the beginning of the saga: when in 1885 the writer Alfred Barnard visited the province, researching this epic tome, Whisky Distilleries of the United Kingdom, he toured 21 distilleries, and proclaimed Campbeltown to be “Whisky City.” So what happened to the renowned city’s distilling fortunes that allowed for such a bust? Was it due to inferior product, U.S. Prohibition, or the history natural cycle? Wait to find out at the Expo! It appears there will be a happy end to this saga: Springbank, a Campbeltown jewel distillery, is very much alive and kicking, producing and offering three different single malts: Springbank, Longrow, and Hazelburn. At WoW, we will taste the double-distilled Islay-style Longrow, proof that a Highland distillery can produce a peaty malt. From another of the three operating distilleries, Glen Scotia, we will taste the 12 YO with a “sea mist” aroma. Magnificent as it is smooth, with a salty palate and the warm, remarkably long and powerful finish. Let us abstract from all things foreign for a second, and return to the treasures of our native distilling, and the achieved personalities behind them—we are proud to be Americans, are we not? Experience Master Distiller Jim Rutledge’s masterpiece: Four Roses Bourbon. Legend has it, it was conceived by a passionate effort of the founder, Paul Jones Jr., to win the heart of a Southern Belle with four roses, and as it turned out later, the palates of bourbon drinkers. Four Roses is the only Bourbon Distillery that combines five proprietary yeast strains with two separate mashbills to produce 10 distinct bourbon recipes, each with their own unique character, spiciness, and rich fruity flavors. Still not totally into the “science behind the art?” Then the Expo (or the Friday Night Dram Club Party) is YOUR chance to ask Four Roses all kind of questions on marrying and barrel selection processes, the origin of the recipes and nature of bourbon sweetness. After all the nice samplings, you’ll be able to conclude that whisky making, as fun as it may seem, does take tremendous talent. More "Made in the USA"
For more examples of wellness in “Made in the USA” category, simply explore the tasting decks and seek out the new, first-time-out spirits of some of America’s amazing micro distilleries. From the midwest Corsair Artisan with its incomparable unaged rye and triple-smoke whiskey to the northwest's Dry Fly Distilling with their “farm to bottle” spirits. From High West in Utah and its amazing Rendezvous Rye and circling back to Templeton Rye Spirits, whose owners are continuing to produce, now legally, the consistently “awesome” Prohibition Era straight rye, Al Capone’s “good stuff” whiskey. We encourage you to see what’s new and different in the spirits world. Use the Expo to expand your horizons and really experience the spirited lifestyle of fine spirits, fine food, Celtic art, craft, and music. And don’t overlook the Whisky Seminars as a unique chance to get more personal with your whisky favorites and their amazing makers. Book online, the LAST seats available. Independent Distilleries of Scotland: Who are they? What are they?—Take a virtual tour to the most non-touristy hidden gems of Scotland's whisky production and sample their exclusive, hand-worked and most sought-after whiskies. 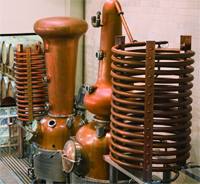 Craft Distillers Discussion Panel: Learn about the art, craft, and creativity used by the highly ingenious American Craft Distilleries. A Tale of Two Whiskies: Ardbeg and Glenmorangie with David Blackmore, the 2012 Icons of Whisky Ambassador. We’ll bring you more spirit-raising updates in a short while. Additional WoW Sponsored Events !!! We had an excellent whisky dinner at the Cigar Bar & Grill. The food was sensational and the whiskies were thoroughly enjoyed. What seems to be under the radar are brands with an apparently low advertising budget; respectable whiskies with prices within the weekly grocery budget. We started the evening with an amuse-bouche paired with the 8 Seconds Canadian. This whisky with a light smooth taste, as expected from a Canadian Whisky, progresses to a sweet and lightly spicy finish that blends well when followed by the potato pillows with caviar. The first course with the salad and vinaigrette was served with the 8 seconds Premium which exhibits a little more spice on the finish. The salad also had a small strip of cured ham on it. The challenge was to pair the whisky with the salad without the influence of the bacon, as this seemed like cheating. What whisky wouldn't be enjoyed with this thin, crisp, briny flavored piece of protein? And yes, I cheated. The 8 Seconds finish lasted long enough to enjoy the bacon flavor on top of it. An obvious pairing for scallops is Scotch; we poured the Muriheads Silver Seal 8 YO to accompany the deliciously sweet and buttery scallop. It was a delight to the taste buds when followed by the Scotch, which rinses off the buttery sweetness before it becomes a liability to the palette, being replaced with the pleasant fruitiness of the Scotch. With the grilled pork we experimented with two bourbons: the Buck and the Wathen's Single Barrel. The caramel and vanilla nose of the bourbons add so much depth to an already artfully prepared pork with truffled root vegetable puree and sherry port reduction. (No photos were taken as this course refused to wait long enough on my plate for a photo.) We finished off the tenderloin and the Buck bourbon and saved half of the Wathen's in our glass. As an extra treat, we had a second Wathen's from a different barrel for a side-by-side comparison with the first one. They were definitely different and everyone had varying opinions on which they liked better. Saving the Wathen's each person preferred, we then poured the IWSC 2011 Best of Class, Murihead's Silver Seal 12 YO in a separate glass to compare both these profiles with the coffee creme brulee. While the bourbon, with its caramel and vanilla flavors, matches and brings out the caramel and vanilla of the brulee, the Scotch has a contrasting flavor which also makes a pleasant pairing. So, which was better? Different folks with different palates, but both pairings fit the definition of dessert. Don't miss out our next dinner at the City Club of SF, March 29. Or call the hotel directly at 800-445-8667 and mention the code WHIS. Please note that the supply of discounted rooms is limited.